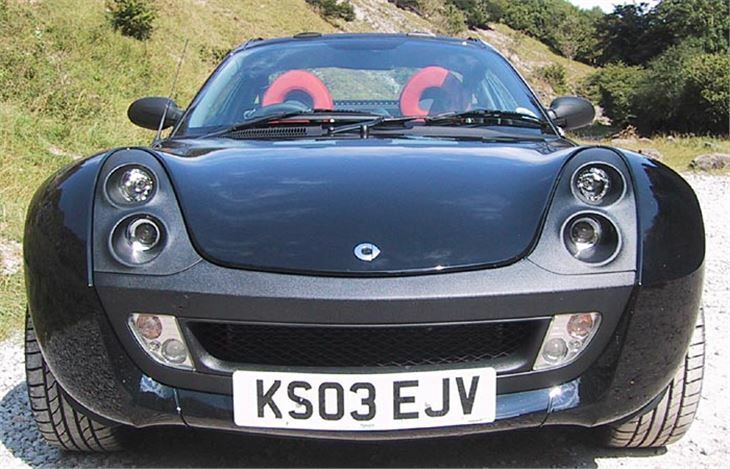 The Smart Roadster is a gorgeous little toy. 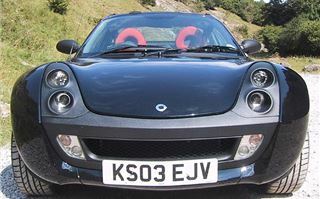 The first time I saw a Smart Roadster was at the unveiling in Berlin in Summer 2002, and I couldn’t wait to drive one. The low stance, the mid engine, the paddle change gearbox and the huge tyres sticking out of the sides all said “fun, fun fun”. But I had to wait. 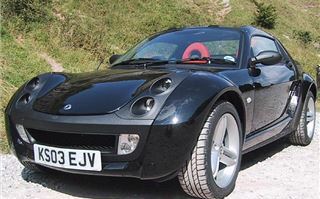 Until January 2003 when we got to drive pre-production LHD versions on some wonderfully snaky roads in Portugal. 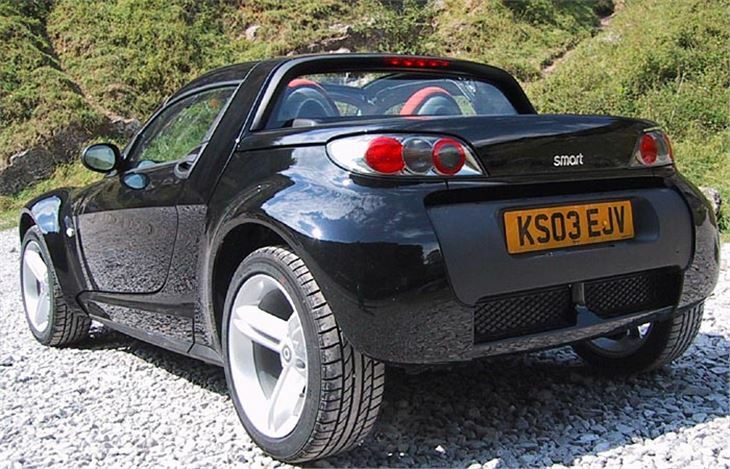 Now, finally, at the end of the best summer most of us can remember, RHD Smart Roadsters are here. They seem to have been an awful long time coming. So were they worth the wait? How would they take to Britain’s crowded, speed-limited roads as winter approaches? As you can see from the photos, the one I got was so black it looked like Darth Vadar’s mask. But it does look surprisingly good in black. Much less of a toy and much more of a fashion accessory, whether you’re a bloke or a bird. It’s not quite as much fun as you think it’s going to be. The tiny 698cc engine rorts and snorts behind you through its narrow power band that ends at 6,000rpm. But the power steering is feather light with almost no feel to it. If ever a car didn’t need power steering, this one doesn’t. Could be my particular car needed its tracking re-set. I had to fling it about a bit to make sure it was actually gripping. But it was, and does. 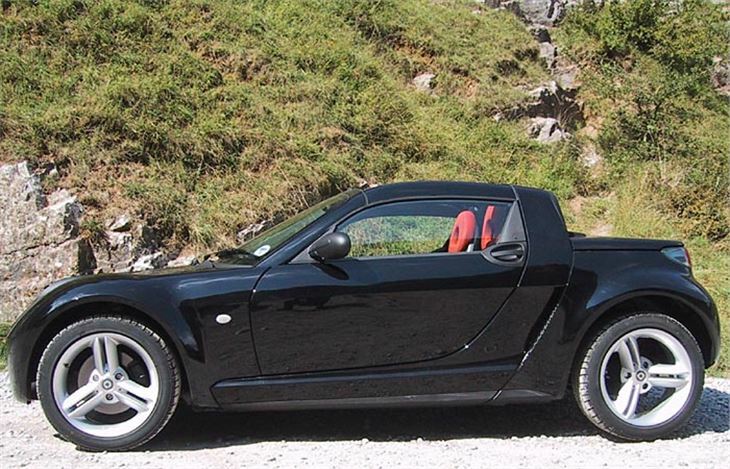 There’s nothing quite like blasting round a never-ending bend in a Smart Roadster. As long as you can keep a grip on yourself, it will keep a grip on the road. It won’t actually be going all that quickly, mind. But you and your passenger will think it is. And that’s the point of a small sportscar. You can have fun without licence-grabbing cameras flashing at you all the time. On to the paddleshifts which are part of a £655 Sports Pack which includes fat alloy wheels and tyres and is the number one essential extra cost option. 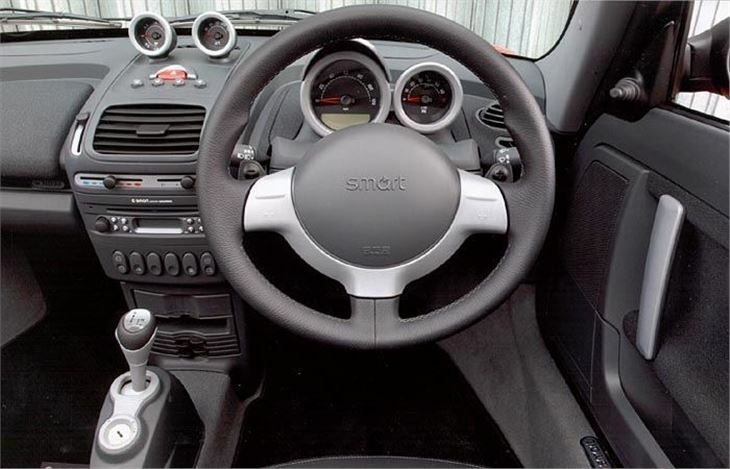 Smart seems to have heeded a few criticisms since the Algarve expedition. Gear changes can still be an annoying fraction of a second slow, but you can keep it in the power band. And it may be my memory playing up, but the speedometer display that tells you what gear you’re in seems to have quadrupled in size. 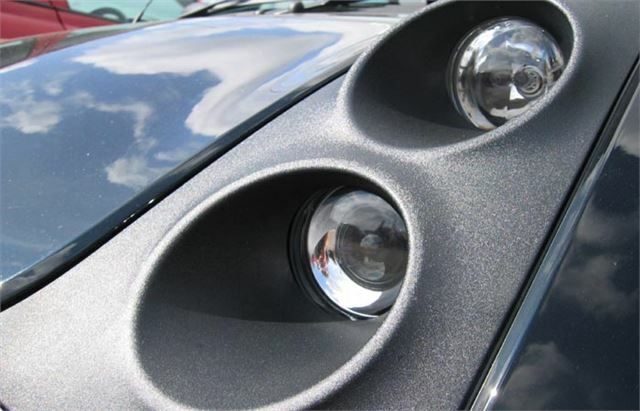 You can now see at a glance instead of having to re-focus, and that makes a huge difference to getting the most out of the car. And instead of a mph/kph speedo it’s just mph with a teeny weeny kph readout to comply with Type Approval. All the priorities are right. None of this means you have to drive the thing like Michael Schumacher. You can just leave it in ‘automatic’ mode if you want and the box will change up and down its six ratios by itself. 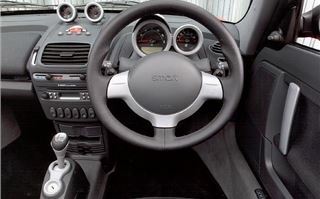 And you can, of course, use the wrong-way-round floorshift lever which you push forward to change up and pull back to change down. 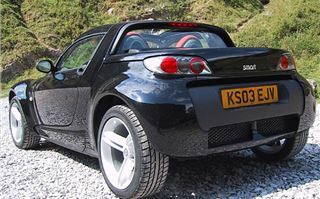 Smart claims you can raise and lower the electric canvas roof at any speed up to 110mph. Forgetting the speed, this is a very handy feature for an autumn launch. Spot a few rays of sunshine and at the press of a button you can have them shining down on your head. There’s a bit of buffeting from trapped air, but not much, and you can alleviate that by opening a window a tad. If you want the full drop top effect, you can unclip the roof side bars and stow them in the front boot. But if, say, you’re on a long holiday journey, maximising the available luggage capacity with Smart’s fitted bags, you’ll be happy enough with the soft-top open and the roof bars on. If you want total security, you can buy a two-piece hard-top that, when not in use, takes up all the rear luggage space. 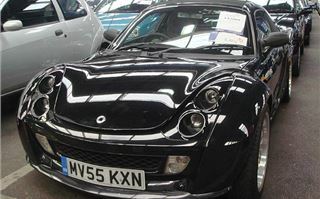 Alternatively, you can buy the better equipped, more expensive Roadster Coupe that has a kind of bubble back (pix in original LHD Smart Road Test) and comes with removable hardtop as standard, but electric soft-top as an optional extra. All those extras can add up. 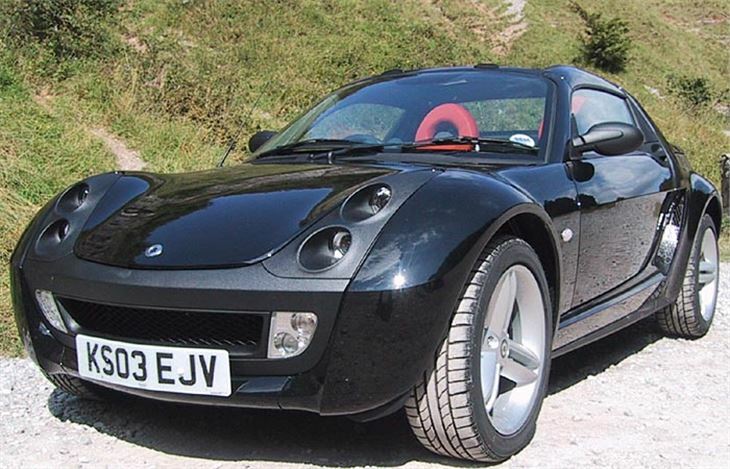 Pay £13,495 for a Smart Roadster and it will cost you £655 to add the Sport Pack of fat tyres and paddleshifts, £595 to add aircon, more for the roof panels, £95 for extra instruments, and around £150 for the fitted luggage. 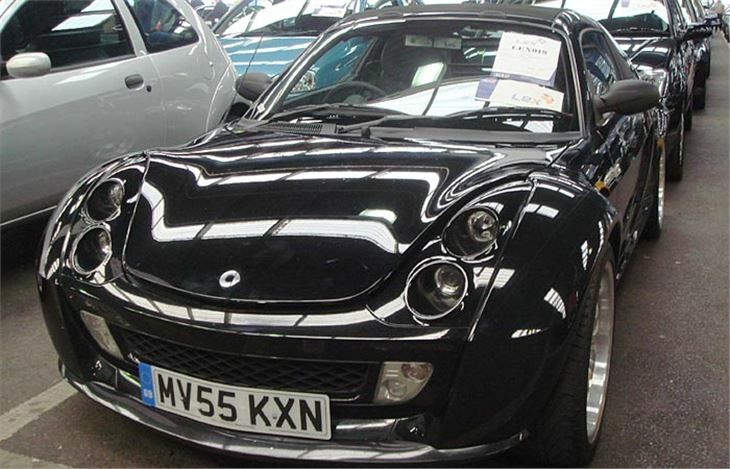 Go for a Roadster Coupe at £14,495 and you get 15” alloys and aircon as standard. But the electric roof will cost you extra. Lastly, a word about safety. This is a tiny car so you’d be right to be worried. Well, don’t worry. These days Mercedes goes overboard about safety. The basic car is a high tensile steel ‘Tridion’ safety cage (the rest is plastic and aluminium). There are twin full-size airbags, belt tensioners, belt force limiters and a non-intruding steering column. And, so you won’t get yourself into a situation where you need any of this, the car has switchable electronic stability program, cornering brake control, ABS and hydraulic brake assist. Finally, a word about ride quality. You’d expect it to be bone-jarring, but it’s actually so good you don’t even think about it. 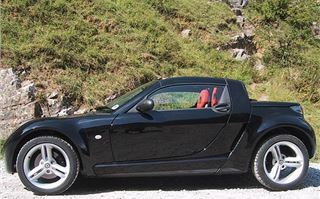 This is one sportscar that sticks round corners like glue, yet doesn’t line the pockets of osteopaths. Did I like it? Yes, of course I did. It’s not as much pure fun to drive as a MINI Cooper, but it is fun, and safe fun, and nothing else on this earth looks like it. Next year will be its year.